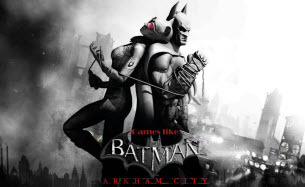 Games Like Batman Arkham City '+g+"
Batman: Arkham City is an action-adventure game developed by Rocksteady and published by Warner Bros based on the DC Comics character Batman. It is the sequel to the 2009 video game Batman: Arkham Asylum and is set one year after the events of Arkham Asylum. Play as the dark knight as he battles through Arkham City, the maximum security home of all the villains that Gotham has to offer. If you are a fan of action-adventure games like Batman Arkham City and looking for more games with similar gameplay then find the recommendations for it below and don't forget to mention if we miss any games as we keep on updating this list. Assassin's Creed is a series of historical action-adventure games with a heavy emphasis on stealth, combat, and free-running. The game is presented in a third-person perspective which takes place in 2012,and follows the path of Desmond Miles as he uses the Animus to relive the memories of his Assassin ancestors while protecting them from the Knight Templar's. The Amazing Spider-Man is a third-person open world action-adventure video game based on the Amazing Spider-Man motion picture featuring the Marvel Comics superhero, Spider-Man. The game is set few months after the events of the movie. The combat system is reminiscent of the Rocksteady Studios using a freeflow design and counterattacks. Sleeping Dogs is a 2012 open world action-adventure video game takes place in Hong Kong and focuses on an undercover cop Wei Shen as he infiltrates the ranks of the murderous Hong Kong Triads. Captain America: Super Soldier is a third-person action adventure video game published by Sega. The game is set during World War II, as Captain America takes on Red Skull and HYDRA all over the planet. Combat will revolve around melee attacks which is both a mix of melee and ranged attacks, as well as Cap's iconic shield. Deadpool is an beat 'em up action video game developed by High Moon Studios and published by Activision based on the Marvel comics character Deadpool a psychotic lunatic known for breaking the fourth wall in the comics . The story is set with Deadpool accepting a mission to assassinate news reporter Chance White. Infamous,......if you can think of more, then don't forget to mention it in comments.